Somebody I know wants to open a karate school and devote himself to it full time. He says he's done plenty of research and introspection on the matter and believes he's up to the task. A lot of uncertainty here, I tell my friend, as the state of the economy and the current lack of popularity of traditional martial arts would be potential obstacles. Martial arts clubs come and go frequently, even when times are good. I will say that the ones that do endure seem to be run by people that are doing it exclusively, full time. Maybe that's the secret. I'll share another "secret" with you. If you want to stay in the martial arts game for the long haul you must consider teaching. But is becoming a professional martial arts teacher an advisable career choice? The average salary for a martial arts instructor where I live is at present $40K/yr. Now if you started at something like that it wouldn't be too bad. The cost of living is murder in Greater New York; forty grand won't get you too far here. Subsidizing your income with something else sounds like the ticket, but like I said, it's the full timers that seem to have the most success. One local guy who runs an American kenpo school has been at the same site for twenty-two years! That's extraordinary. He has a huge place with hundreds of students. Again, teaching martial arts is all he does. 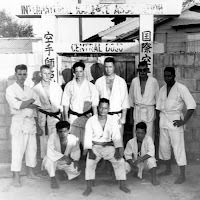 When Tatsuo Shimabuku was commissioned by the US government to teach karate to Marines in the fifties he was paid $300/mo. for his services. Prior to that he was a farmer, but even after he got his teaching gig he still maintained a fortune telling business that he ran on the opposite side of his dojo under his real name, Shinkichi. Somebody who trained with him on Okinawa told me his fortune telling services were in high demand as his predictions were 97 percent accurate. Shimabuku's contemporaries must have seen him as a sell-out for teaching US servicemen karate for money (in due time many of them followed suit anyway) but Shimabuku correctly predicted he would be laughing all the way to the bank.